The Standard has been the king of Downtown LA nightlife for more than a decade, and it isn’t abdicating its throne any time soon. 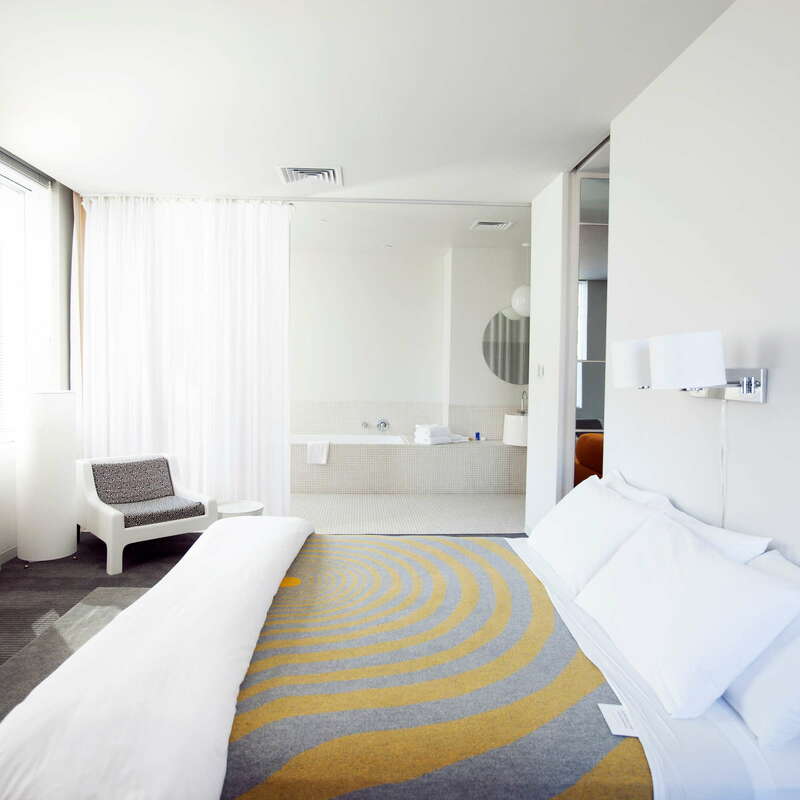 Embraced by young, creative people and downtown business types looking to let loose, the hotel is a hub of the area’s social scene. Even though Downtown LA’s renaissance has given guests plenty of reasons to leave, the hotel does just enough to make you want to stay morning, noon and night. Room types vary from Medium to Humongous to Wow! (exclamation theirs). Hallways are bathed in Standard red, while the rooms are flush with mod furniture, platform beds and stunning views. Looking for a great deal? Download the hotel’s One Night Standard app and find the best deals on last minute bookings. Not for the timid, the white-tiled bathrooms are decidedly translucent with large sunken tubs and raised sinks. There's a strategically placed curtain to divide the toilet off from the rest of the bathroom, but it's not much. 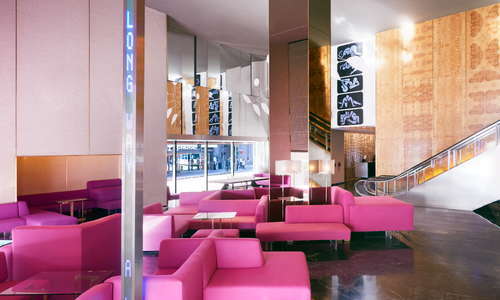 The hotel lobby is awash in purple couches, an artistically designed ping-pong table and a slightly hidden coffee shop (under the escalator). Hermanos Coffee also doubles as a wine bar at night, which helps set the tone for the DJ posted up in the middle of the room. Guests can get a complimentary 15-minute grace period with the valet for a quick grab-and-go coffee. An L-shaped oasis, the rooftop pool is the hub of social life at The Standard. While there are down times for simple relaxation, the pool is usually the home for daytime DJ bashes, pop-up events, movie screenings and live music shows. YOU SHOULD KNOW Nighttime events don’t have guaranteed entry for hotel guests. Dress up to help your chances, or beg the hotel to help you get on a list. A fitness center is soaked in Standard red and has classic Hollywood muscle-heads staring at you from the walls (Rambo, The Hulk, Wonder Woman, etc.). Peloton bikes are the highlight here for ultra-competitive workout fiends. Before a full day of soaking up the sun by the pool, relax your mind with free rooftop yoga on Saturday mornings. 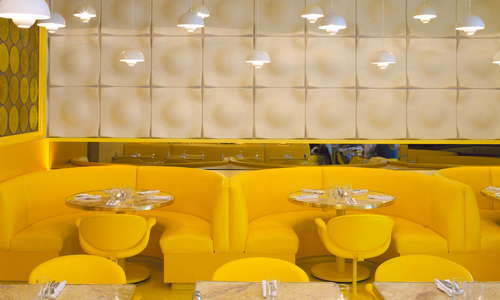 The 24/7 Restaurant serves creative Cali-cuisine. 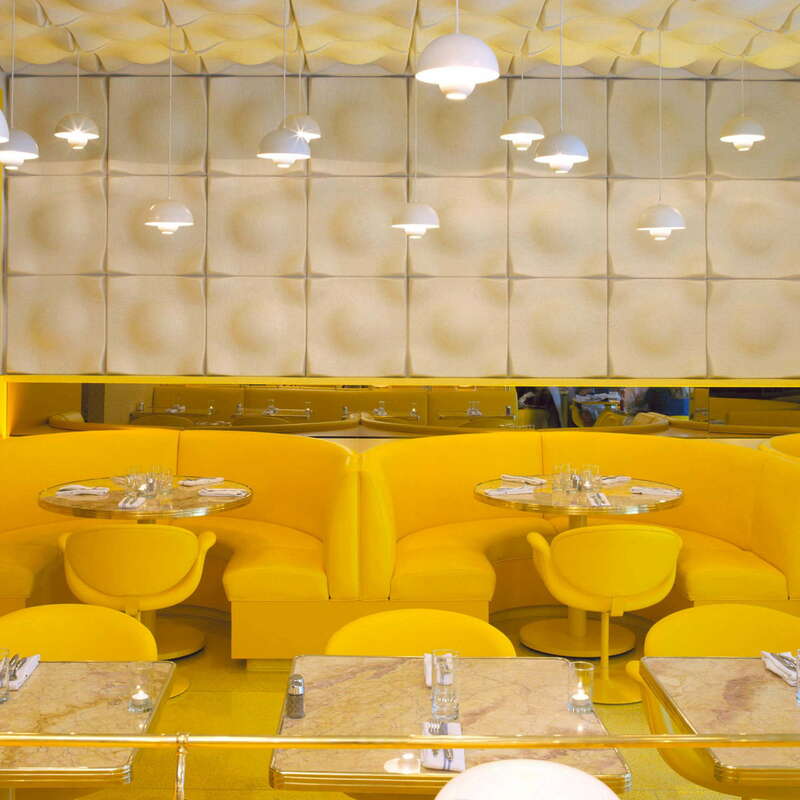 The yellow-hued restaurant also has an exceptional patio. The great nightlife surrounding this hotel deserves its stellar reputation. As mentioned, the rooftop pool has a variety of entertainment every night of the week. Adjacent the pool is also The Standard Biergarten with great beer and oversized pretzels. 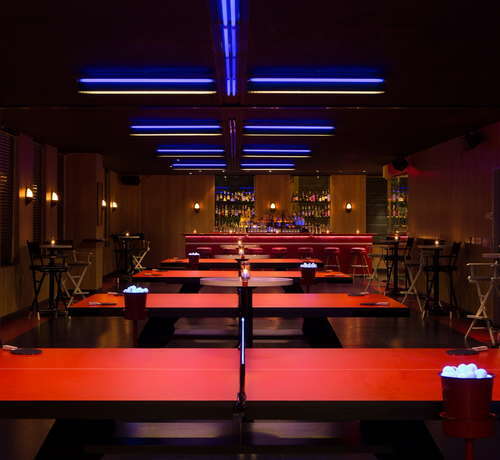 Inside the hotel, ping-pong fanatics can check out SPiN, with 11 tables, three bars and a much easier door than its rooftop counterparts. Downtown is very walkable, and the hotel is minutes away from restaurants, shops, bars and attractions. There are metro stops all over, the closest a block south of the hotel that can take guests to the beach, Hollywood or Universal Studios. Flagging down a taxi or hailing an Uber or Lyft is very simple here and can get you around the city quickly. Renting a car can be tricky, only because parking is hard to find or really expensive. You Should Know: Walking around at night downtown can still be somewhat dangerous. Be mindful of your surroundings as wrong turns can lead you into sketchy areas. There are restaurants on every corner around the hotel, but it’s worth walking a few blocks farther for Q (6-minute walk), a pricey Omakase sushi spot that will blow your mind or Bottega Louie (6-minute walk) for mouthwatering Italian. While you should be satisfied by the unbeatable nightlife in the hotel, Seven Grand (6-minute walk) is worth the walk as they have the greatest collection of whiskey in the city. 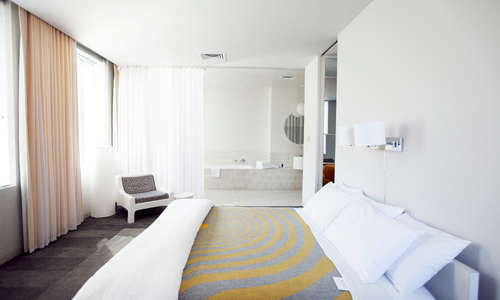 The Standard is the go-to hotel for downtown nightlife. 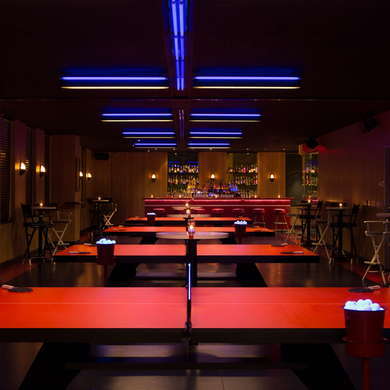 Fun bars, a great pool scene and an array of entertainment options give its young clients plenty of reasons to stick around. 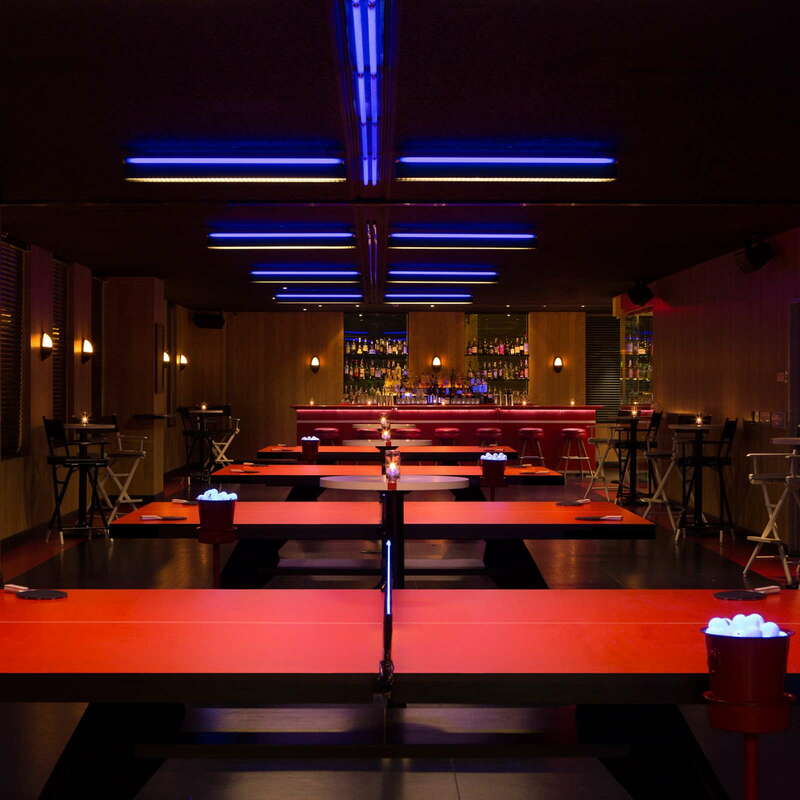 Not the most family friendly spot and service isn’t the biggest priority (they’re reticent to help you get into their own bars), the hotel prides itself on an unmatched social scene. If you want to be around good-looking guests who like to chill by day and party by night, you’ll fit in well at this hotspot.